Zona Franca Santander winner of "best free zone of South America" by the FDI-Financial Times. The only Free Zone in the Americas awarded in four different categories of the “Global Free zones of the year Awards 2015”. 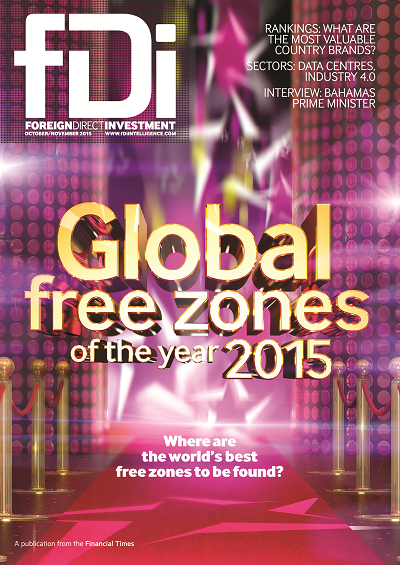 After going through a rigorous methodology that characterizes the studies, rankings and reports of the fDi Intelligence “Global Free Zones of the year Awards 2015”, publication associated to the British newspaper “Financial Times”, which announced the participation of numerous free zones, government entities, and investment promoters globally in midst of being able to obtain worldwide recognition. The criteria implemented by the fDi were: Growth, expansion plans, outstanding performance year to year, number of companies in premises, level of improvement in infrastructure, and level of incentives and support to investors. o Distinguished as an exemplary free zone in Latin America and the Caribbean. o Awarded for BPO/Outsourcing services. o Awarded for training and skills. SME that make part of it; it has also been awarded for its strategies and efforts in the training and education, based on the needs of the clients, done with two universities and the national learning institute, SENA, which make part of an ideal environment for the betterment of productivity; it’s also been recognized for its infrastructure and investments in BPO and Outsourcing, as well as being the first in the country dedicated strictly to the global services industry. It is important to note that Zona Franca Santander is the only one in Latin America and the Caribbean to be mentioned in the study in four different categories awards. This allows us to confirm the valued proposal that Zona Franca Santander: Offshoring and Outsourcing Park, first of its kind in the country, can reinvent itself day to day as an answer to the demands of the market and world class businesses that find in this platform the best option to implement and grow their operations. Zona Franca Santander has come runner-up in the Latin America region for this year’s awards, also winning the award for best zone in the South America sub-region. Employee numbers in the zone increased by more than 85% in 2014, corresponding to an 84% increase in SME tenants in the same year. Zona Franca Santander was also commended for its skills and training efforts, having introduced two universities with training departments, with training programmes tailored to suit the requirements of the zone’s clients. Zona Franca Santander was also in receipt of a specialism award, for its BPO and outsourcing investments. Zona Franca Santander Offshoring and Outsourcing Park, a new business park measuring 32 hectares, is the first of its kind in Colombia, dedicated solely to the global services industry”.